Sean Kennedy (hype) added a comment to T63408: Video mask bindings with left click select not working as intended. Perhaps I should create a separate bug report, but also when in the MCE, right click controls the timeline and the time slider in the dope sheet. Shouldn't those also be left click? Also, once the mask is drawn, you cannot select the vertices and adjust them with left clicking, only with right clicking and dragging. It should all be left clicking. Not sculpting, but rotoscoping. Drawing a mask for rotoscoping in the MCE. Sean Kennedy (hype) created T63410: Mask display not updating correctly. Sean Kennedy (hype) created T63408: Video mask bindings with left click select not working as intended. Sean Kennedy (hype) created T59167: Node knife tool. Sean Kennedy (hype) created T59166: Adaptive domain . Sean Kennedy (hype) added a comment to D2106: Cycles: Proof-of-Concept Implementation of Cryptomatte Matte ID pass system. So I am wondering is there any need for this kinda thang anymore? Sean Kennedy (hype) added a comment to D2493: Compositor: Add Distance Transform Node. Sean Kennedy (hype) added a comment to D3606: Image Editor: Add option for showing a matte based on Cryptomatte render passes. Hey @Sean Kennedy (hype), do you think that viewing the matte for cryptomatte objects in the image editor is a useful feature? Sean Kennedy (hype) added a comment to D2772: Tracking: Highlight keyframes in path visualization. Hoping this is in the latest trunk, and makes it to 2.8. I haven't forgotten about these awesome motion tracking updates! Sean Kennedy (hype) added a comment to D2771: Tracking: Blend transform offset when manually re-positioning track. Any more work done on this lately, has it been added to trunk and I missed it? And will it be ported to 2.8? Still looking forward to having this feature! Interesting idea, being able to set the amount of frames. Right now I believe it works between keyframes, which is how a typical matchmover works in their daily tracking work. I prefer the keyframe way myself, since it's very easy to simply set a keyframe on the last good frame, then go to where the drift is at it's worst and adjust it. If we do add the amount of frames option, let's please still retain the current functionality, as well. I do also like the idea of it being a mode to enable, or even just a checkbox to turn it on or off, so you definitely know when you are in refining mode. I'm happy to test this if there's any updates and an updated Windows build. This is great! Happy to test it if a Windows build is available! Sean Kennedy (hype) added a comment to T47267: Set Render Border Add-on. I would indeed find this very useful. For example, say I turn on border render to render out a small vfx element faster. Then I get notes on the shot, so I go and do more versions, versioning up as I go, turning off border render because maybe in these new versions the effect is different. Eventually they settle on something very similar to the first version I submitted that had been rendered with border turned on, but I'm now 10 versions later and I've moved the border to other places. My compositing setup (in Nuke) is already setup, so if I can render with the exact same border dimensions as 10 versions earlier, I can easily just drop in the new render and not have to worry about anything. That's how I'd use it most. Working great when using G to move around the marker, and also works with arrow key nudging after pressing G.
Awesome, thanks! Will test this weekend! Sean Kennedy (hype) added a comment to T51844: Custom Manipulators: Where to take advantage of manipulators. @Sean Kennedy (hype) Good suggestions, added. Question though - is this for tracking points or mask too? Sean Kennedy (hype) added a comment to D2411: Compositor: Add Anti-Aliasing node. Looks neat! I'd be happy to test it on some vfx type things. Sean Kennedy (hype) awarded D1788: Cycles: Experiment with shadow catcher a Love token. 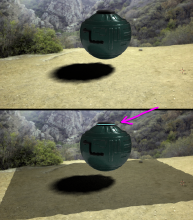 Sean Kennedy (hype) added a comment to D1788: Cycles: Experiment with shadow catcher. And as I was doing a demo scene for a blog post, I noticed that a mesh light on my test object was wrecking the shadow catcher. It's a bit strange that a geometry light was wrecking the scene in my blog test scene, but the mesh light in the other test scene did not. Perhaps it has to do with the positioning and shape of the mesh light. In mt blog test scene, it's a cylinder, and is inset into other geometry a bit. Perhaps that's causing the ground plane to be picking up a big cast shadow from the geometry that is blocking the cylinder light? I did a couple tests to see if I had any problems in the alpha channel. I like it so far! Simple to set up, very nice to see in the viewport, and a bit faster and easier to use in compositing. Great work! Looking forward to seeing how it continues to develop. Thanks for the add! This sounds great! Sean Kennedy (hype) added a comment to D583: Rework 2D stabilizator. I understand the issues now, I think. Seems odd to me that there's no way to stabilize the scale without a pivot point, but I'm not a coder, so not sure how much advice I can give on how best to make this work. Ah, okay, I see. That definitely makes a difference. Indeed it does work. There's still a slight problem that when Zoom is enabled, in my 2 point example, the image drifts upwards. I made a quick video to demonstrate. Sean Kennedy (hype) added a comment to T48010: Tooltips wrong for Image sequence Node in Compositor (and likely other image sequene inputs). What would be absolutely amazing is if once you selected Image Sequence or Movie, the node gave you a little visual timeline to adjust the in/out, placement, and length of the clip. Sean Kennedy (hype) added a comment to D1591: Compositor: Expose track velocity via the Track Position node. How does this work? I'd love to test this. Where is the feature found? Sean Kennedy (hype) added a comment to D1663: Compositor: Add option to extend image bounds when blurring. Gave it a quick test run this morning, seems to work great! Only tried it with a couple things, so I will explore it a bit more soon. But wow, what a great feature! Thank you guys! Windows, please. This is one of the most needed features in the compositor. :) Very exciting! Spectacular! Will this be in buildbot to test in the next day or so? No strong opinion on this, if users find useful - seems OK? Sean Kennedy (hype) added a comment to D1579: Masking: Cut Splines. @Sean Kennedy (hype) Thank you for the report. Mask points are parented individually. The solution I found was to check whether both neighbor points have the same parent. If they do, the new point is also going to be parented to the same track/plane. If they don't the new point won't be parented at all. Does that look like a good solution? Sean Kennedy (hype) added a comment to rBea67f55b87e3: Compositor: Add Invert option to the movie clip stabilization node. Is this in the daily builds? I'm not seeing it yet. Sean Kennedy (hype) added a comment to D1590: Image editor: Add options to display separate R, G and B channels. I would love to test this out. Is there a way to get a windows build (I don't compile)? Sean Kennedy (hype) added a comment to D1257: Mask Overlay with Custom Color and Custom Spline Colors (per Mask Layer). It seems a bit overkill to have different colors for spline and overlay. Wouldn't it be enough to have one color for both, and the alpha which applies only to the color overlay? 1a. Or actually, maybe just keep the current way of coloring when in outline mode, only when line display is changed to "line" (that other patch i believe?) use the mask color for the spline. Maybe it would be possible to change the blending? If I have several masklayers with the same color, I think it would be better to just merge them instead of alphaovering their values. Only if the colors are different, use alpha blending. Feathering should use the colors as well. Sean Kennedy (hype) added a comment to T41538: Sun Beam Node has artifact at its radius..
Sean Kennedy (hype) added a comment to D655: New compositor node "Sun Beams". Sometimes there are stray beams coming in from something not apparent in the input image. Ray Length should also get a factor input per pixel to give more control. A typical case where this would be handy is crepuscular rays (aka "god rays") from cloud patterns. These are affected by perspective and should be shorter in the distance, but currently all rays are the same length. Doing this efficiently is possible, but may require a few changes to the compositor code. I think it'd be more natural to control an Angle Offset (like the Glare node) instead of an arbitrary coordinate/vector. It'd also of course be useful to be able to control the ray length and angle using a texture, though this could be added later like the falloff mode. Sean Kennedy (hype) awarded D655: New compositor node "Sun Beams" a Love token. Sean Kennedy (hype) raised the priority of T38752: Mask scaling not working from to Needs Triage by Developer.